Researchers at the European Southern Observatory’s Very Large Telescope (VLT) in Chile have captured stunning new images and prepared the highest-resolution maps to date of Jupiter, a week ahead of the arrival of Nasa’s Juno spacecraft at the giant planet on July 4. The images were captured at the thermal infrared wavelengths using a newly-upgraded thermal imager called VISIR. “We used a technique called ‘lucky imaging’, whereby individual sharp frames are extracted from short movies of Jupiter to ‘freeze’ the turbulent motions of our own atmosphere, to create a stunning new image of Jupiter’s cloud layers,” said Leigh Fletcher from University of Leicester. 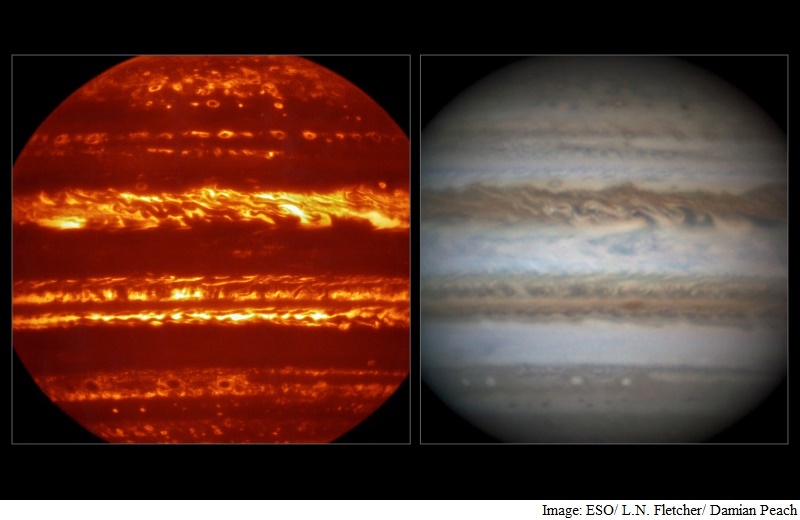 “At this wavelength, Jupiter’s clouds appear in silhouette against the deep internal glows of the planet. Images of this quality will provide the global context for Juno’s close-up views of the planet at the same wavelength,” he added. Jupiter’s high resolution maps, which reveal the present-day temperatures, composition and cloud coverage within the planet’s dynamic atmosphere, and show how giant storms, vortices and wave patterns shape its appearance, will help set the scene for what Juno will witness in the coming months. The ground-based campaign in support of Juno is led by Glenn Orton of Nasa’s Jet Propulsion Laboratory. Once in orbit around Jupiter, Juno will skim just 5,000 km above Jupiter’s clouds once a fortnight – too close to provide global coverage in a single image. The Earth-based observations supplement the suite of advanced instrumentation on the Juno spacecraft, filling in the gaps in Juno’s spectral coverage and providing the wider global and temporal context to Juno’s close-in observations.